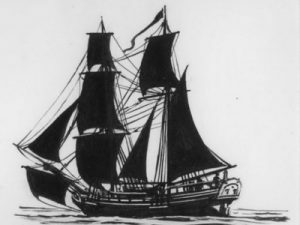 Packet Commander Edward Lawrance kept a journal of the voyage of the Anna Teresa from Falmouth to the West Indies via Madeira 9 June to 10 August 1776. This was written as an extended letter to his wife. As well as describing the islands he was visiting, he thoughtfully included sail settings, weather reports and latitude and longitude sightings. Sadly this was his last voyage. The journal ends abruptly on 6 August. Four days later he was dead; we assume from disease. On his visit to Tobago, he complains of the ‘musketos’ and comments on the problems experienced by planters in Martinique without actually including disease. Did he pick up something in Tobago at the end of July or in Martinique a few days before his death? The account, seemingly copied by his son Commander George Bell Lawrance RN, was donated by the family to the old Cornwall Maritime Museum. It has been transcribed by Volunteer Gail Hawkins and lightly edited, retaining Lawrance’s original spelling wherever possible but adding the occasional full stop for ease of reading. The account of some of his stops bear comparison with that given by Packet Surgeon James Williamson some 52 years later, in particular, the detailed description of Madeira. Start reading here or download whole journal as a pdf file..